Paul Manning is able to offer a wide range of treatment to his patients. 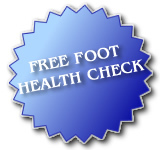 In addition to the FREE foot health check offered to all prospective patients, all new patients who attend for treatment will receive a brief assessment of the state of their feet. This will comprise a check of the circulation, neurological situation and skin condition and any anomalies will be noted and brought to your attention. 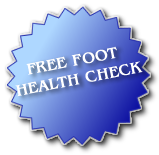 Should you be diabetic, these checks will be made more comprehensively as diabetes can have serious implications for the feet. Treatment and advice is available for all foot problems, from that irritating bit of dry skin to general aches and pains in the feet and legs and everything in between. (Corns, callous, problem toe nails - be they thickened or ingrowing, skin problems, verrucae, split heels, heel pain). Orthotic treatment is available and may be used where indicated by symptoms. Off-the-peg devices are normally used as they are very effective and keep the cost to the patient reasonable. In fact, if you have or only think you have a problem with your feet contact me. Treatment is in the most part virtually pain free and Paul Manning is noted for his gentle, caring approach. We have clinics at Rugby, Cotteridge and Knowle which are all located on the ground floor and have approved disability access to them.